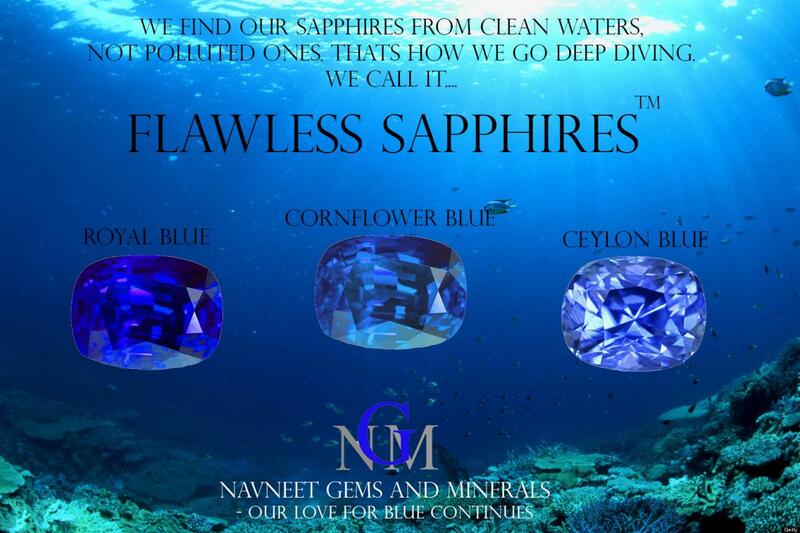 We are Navneet Gems from Thailand, a genuine supplier and manufacturer of Wholesale Australian Sapphires made as per specifications by qualified/certified gemologists. We have been in the industry in Thailand for a long time. Navneet Gems was founded in 1993 and stems from roots well before that within the Agarwal family. Yes we are a family business and our priority is to live and do business with honesty and integrity. And to do our heritage proud so that our valued clients know that they have a partner they can trust. Sapphire is the term for Aluminum Oxide (corundum). This durable material is the second hardest natural substance on earth and is found in a wide array of colors. Ruby is red or pink corundum, all other colors are called sapphire. Blue is the traditional color but sapphire can also be clear, green, yellow, gold, purple, peach or pastel. Colored and color changing sapphires are also known as “Fancy” or “Party” colored sapphires. 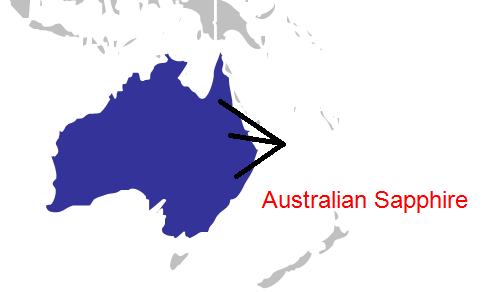 A little bit of background to the Aussie or Australian Sapphire. Sapphire has been mined in Australia for over 100 years and Australian mines have produced commercial quantities for at least 50 years. The mines of Australia have produced more commercial-grade blue sapphire than any other source in history. This fact is more startling when you consider that Australian sapphires became popular only after the well known Thai heating process was vastly improved in the 1960s. (The Thai’s are known to be the best in the world at this and one of the reasons Bangkok is such a big trading hub for Gemstones). The history of Australian Sapphires stretches back over 150 years. One of the first reports is from 1851 when sapphire was recovered during gold mining on the Cudgegong and Macquarie rivers in New South Wales. In 1854 sapphire was reported from the New England area of New South Wales and in 1875 Sapphire was discovered in Retreat Creek, Central Queensland. Numerous small deposits have been found up and down Eastern Australia. The discoveries near Inverell on the New England tableland in Northern New South Wales and at Sapphire and Rubyvale in Central Queensland lead to the development of a commercial Sapphire Mining Industry in Australia. The much later discovery of sapphire at Lava Plains in North Queensland further complemented this industry. Let’s compare these Aussie Sapphires to Sapphires from the rest of the world. The blue sapphires from Sri Lanka are known as Ceylon Sapphire. Ceylon Sapphires are unique in color, clarity and luster compared to the blue sapphires from other countries. 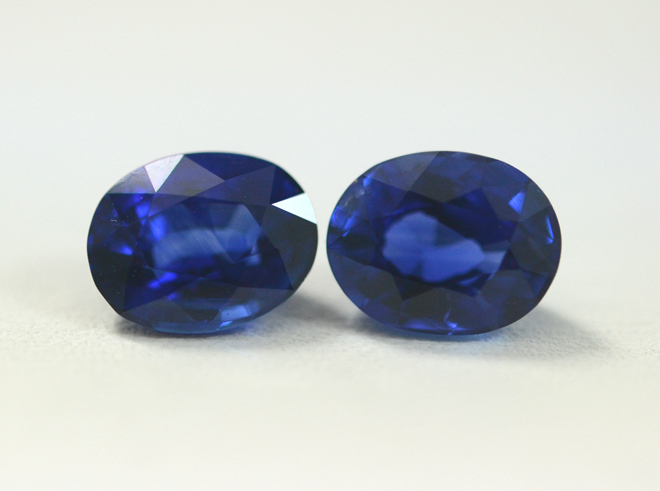 Because Ceylon sapphire occurs naturally, the color of the stone varies. The noted blue color ranges from very pale or greenish-blue to purplish-blue the most vibrant, almost electric indigo-blue hue. Some call it royal blue. It also has more of what is known in the industry as “Fire in the hole”. 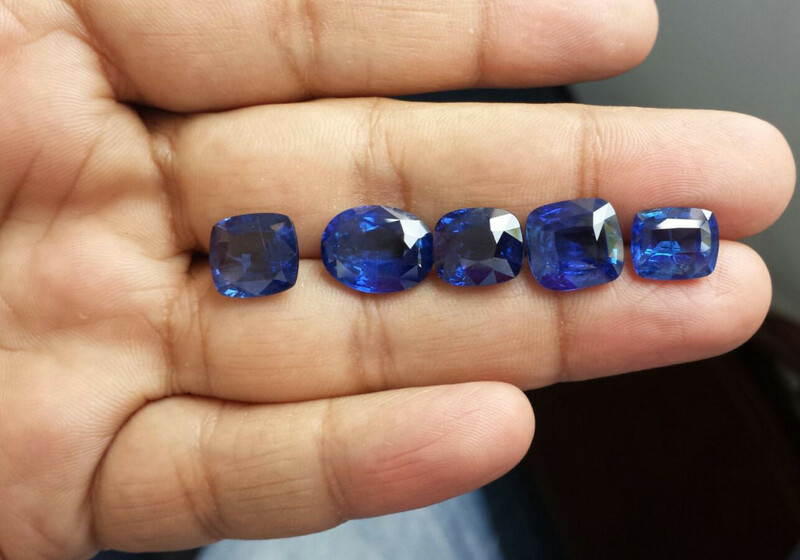 The quantity and quality of blue sapphires coming from Sri Lanka is only rivaled only by new deposits found in Madagascar. The sapphires from Madagascar are in many cases almost impossible to tell apart compared to sapphires from Sri Lanka. 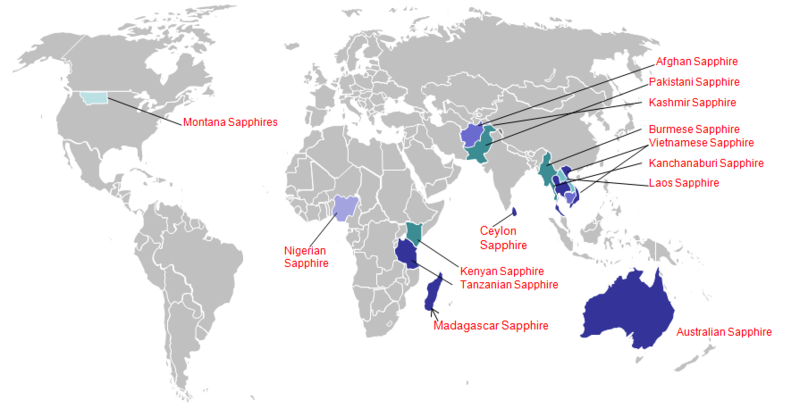 Color, tone and internal crystal characteristics of Madagascar and Ceylon sapphires are almost identical majority of cases. Burma (now called Myanmar since obtaining independence from the British empire) is another long time producing country of good quality blue sapphires. Usually Burmese sapphires are described as royal blue, typically on the darker side of royal blue. Burma does produce excellent stones, usually in smaller quantities but larger the upside is that the stones usually are larger in size. The Kanchanaburi mines yield blue, yellow, pink, and star sapphires, although production has now declined significantly. Because Thai sapphires are often dark, they are frequently heat-treated. They have good color, are opaque and have “fire in the hole” Bangkok and Chantaburi have become major sapphire cutting, treating, and marketing centers, it is estimated that about 70 percent of the world’s sapphires pass through Thailand before reaching the consumer. A vast majority of Australian sapphires, almost 90% by weight occur in a number of different shades of blue. These shades range from colorless through to Royal blue to some of them that are so dark they appear almost black when they are cut. The biggest market for these stones is Russia; these stones have good clarity and are transparent. It is thought that these dark stones are so popular in Russia because it contrasts the white of snow. Princess Kate recently wore one of these stones on a jewelry piece. Major sapphire deposits have been found in the Anakie fields in Queensland as well as the New England fields in NSW (New South Wales). However some deposits have been discovered as far north as Cooktown (Queensland) and as far south as the island of Tasmania. 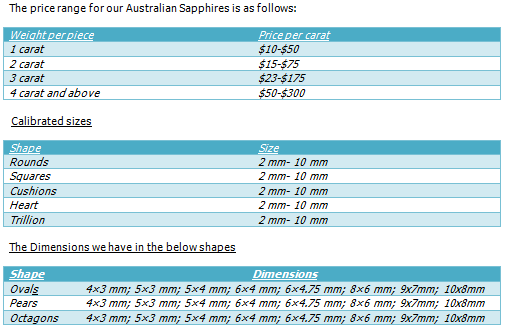 At Navneet Gems Wholesale Australian Sapphire comes in all shapes and sizes. Chose your cut or we can make to specifications. Australian Sapphires are popular in bigger sizes because they come clean and dark. So for price, size and clarity these stones are a very good option if you are looking for more! Cutting is expensive in Australia and the best artisans are in Bangkok so the stones come here where we are based. We at Navneet Gems import the rough stones directly from the mines there. 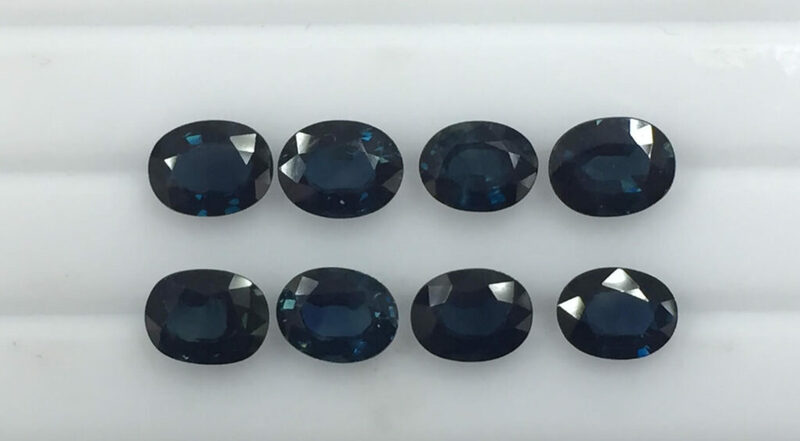 If you would like to know more information regarding Wholesale Australian Sapphires feel free to drop us a mail at info@navneetgems.com , also if you are interested in Wholesale Blue Sapphires check out some info here http://bit.ly/2bA1NHj . We hope that you enjoyed the information we have shared with you and that it helps you to confidently choose Navneet Gems for not only Wholesale Australian Sapphires but for all your wholesale gemstone needs. Rest assured that with us you will find a partner who conducts business with honesty and integrity. “The difference between false memories and true ones is the same as for jewels: it is always the false ones that look the most real, the most brilliant”.